I have created an envelope maker that will let me print out a clear address on regular paper, then fold it around a toploader to make a very protected easy mailer. To use the Envelope Maker, go here. You will have to have a PDF reader like Adobe Acrobat Reader installed, as the Envelope Maker creates a PDF. 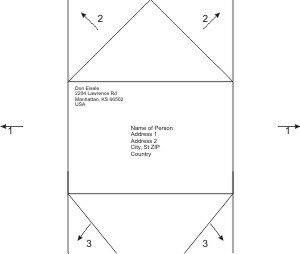 Place envelope face down on flat surface. Use cellophane tape to tape toploader into middle of envelope (opposite the address). Use one piece of tape for each of all 4 sides to ensure postal machinery does not rip toploader out of the envelope with a catch. I have found over the years that securing the cards in the envelope works much better than having a toploader loose. A loose toploader tends to catch in the postal machinery and rip out of the envelope. Also note that if you are using more cards that can fit in a toploader (about 4 if you are careful), the thickness is such that you should probably use a bubble mailer.